You can grow in any size room. A 3 by 3 closet, a 3 x 6 closet, or an extra bedroom or garage. I have run as much as 1000 watts in a 3 foot by 3 foot closet. I was only able to do this because of the extreme ventilation system that I installed. This of course was over kill. A closet of this size should have no more than a 400 watt fixture. 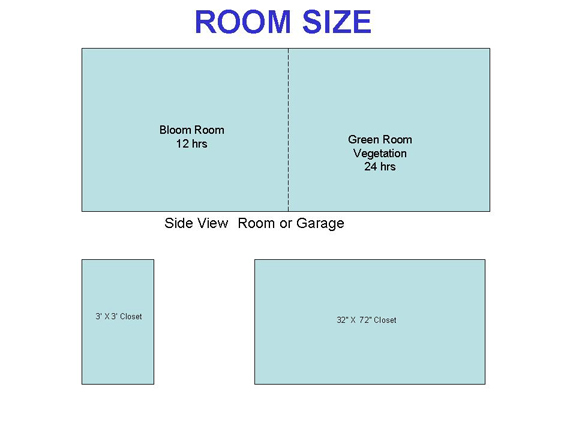 Room size can make a difference, but you can grow in a small area with great success. You can split a single room into two with some plastic material. Remember to line your room floor with good plastic if you have carpet. Make sure you wrap the plastic up the wall at least 6 inches to contain moisture and spills. No matter what size your room is, you can grow!